Shoulder injuries are a common event in the history of many throwing and strength athletes. Weightlifters and Powerlifters as well as Body Builders often suffer rotator cuff, impingement or bursitis injuries due to overuse, and/or poor lifting technique. I have addressed exercise technique in other articles. Of course many non athletes suffer from shoulder problems as well and can also benefit from a shoulder injury prevention program. For the purposes of this article I will assume that you are already aware of good posture, proper lifting technique, and are avoiding exercises that are inherently dangerous to your shoulders. That said, despite your best intentions and adherence to good training technique, you may still find yourself at risk for shoulder injury. You best defense is to be proactive and engage in what we can refer to as a “Prehabilitation” program. The shoulder is a very mobile joint. There is a price to pay for that mobility in an inherent lack of stability. 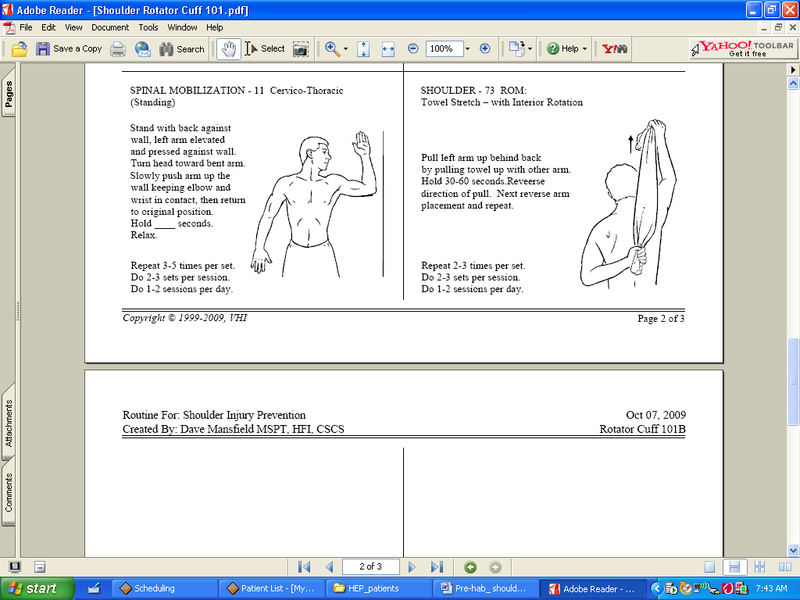 The technical term for the shoulder joint is the “Gleno-humeral joint”. This is a ball and socket type joint in which the socket is relatively small in relationship to the ball. This is designed for mobility unlike the hip joint which is also ball and socket but with a large socket that well contains the ball (the head of the femur). You will note that the hip is less flexible but far more stable than the shoulder joint. In order for you to raise your arms for pushing, pulling, reaching, throwing and all the other activities you use your arms for, there must be a restraint mechanism which allows for all that movement without dislocating the shoulder. There is a tough fibrous capsule that surrounds the joint and gives some support. However, the dynamic stability of the shoulder is chiefly supplied by the Rotator Cuff. This is a complex of 4 muscles which surround the shoulder joint. Over the top of these muscles are the larger deltoid muscles. If you observe the contour of the deltoids you will notice that their angle of pull with your arm at your side is up. This is the case since these muscles are at almost 90 degrees as they cross over your shoulder. When these muscles activate to lift your arm they pull your arm up into the acriomium (the bone at the top of your shoulder). As you can imagine this should cause pain as the head of your humerus (arm) bangs against this bone. It is the action of the Rotator Cuff Muscles that prevents this. When you initiate the raising of your arm the rotator cuff muscles fire and hold the head of your humerus (the ball) into the glenoid fossa (the socket). As you raise your arm these muscles allow the ball to rotate in the joint instead of jamming up against the bone at the top of your shoulder. At about 30 degrees the deltoid muscles start to exert more force allowing you to continue to lift or reach. Once you get above about 120 degrees the rotator cuff once again increases its influence on your shoulder keeping it in the joint. In addition to the Gleno-humeral joint, the other joint involved in the above actions is the scapulo-thoracic joint. This is the kinematic chain involved between your scapula (shoulder blade) and your thorax (ribs). This action must also be coordinated to allow you to stabilize the shoulder joint when you use you arm. One of the problems with repetitive use of the shoulder particularly under load or deceleration (as in throwing) is that the small rotator cuff muscles start to break down. Once they are damaged they do not function properly in stabilizing the shoulder, leading to injury. In addition, since much what we do in life, in sport, in strength training tends to focus on the large pushing muscle of the upper body (lats, pecs, deltoids) we tend to overdevelop these muscles and let the dorsal (posterior) muscles of the back and shoulder get relatively weaker. As a result we get muscle strength and flexibility imbalances that set up a cascade of events leading to shoulder injury. OK, how do we stop this? The basic principle behind injury prevention in any healthy joint is to employ strategies that maintain the flexibility and strength balance between the opposing forces on the joint. This means that exercise programs need to be designed to strengthen weaker muscles and to stretch tighter muscles and other soft tissue around the joint. On the case of the shoulder we need to develop what is generally termed a posterior dominant shoulder. That is the muscles attached to the shoulder blades (which includes the rotator cuff muscles) must be strengthened while the muscles that surround the chest and front of the shoulder need to be stretched. Of course, not everyone has the same deficits so one prescription does not necessarily fit all needs. If you have an injury now, you should consult a Physician, Physical Therapist, Athletic Trainer or other qualified sports medicine professional. There are however general principles that we can apply. One of the chief early indicators of pending shoulder problems is posture. Try sitting slumped forward, now lift your arms over head…now sit up straight, squeeze your shoulder blades together and lift you arms overhead. Notice the difference! As your Momma said, sit (or stand) up straight. You will be doing your shoulders a favor. The rotator cuff muscles are small, postural muscles. As a result they must be strong but must also be able to contract repeatedly for extended periods of time. To train them we need to use relatively high repetitions with relatively low resistance in order to increase both strength and endurance. 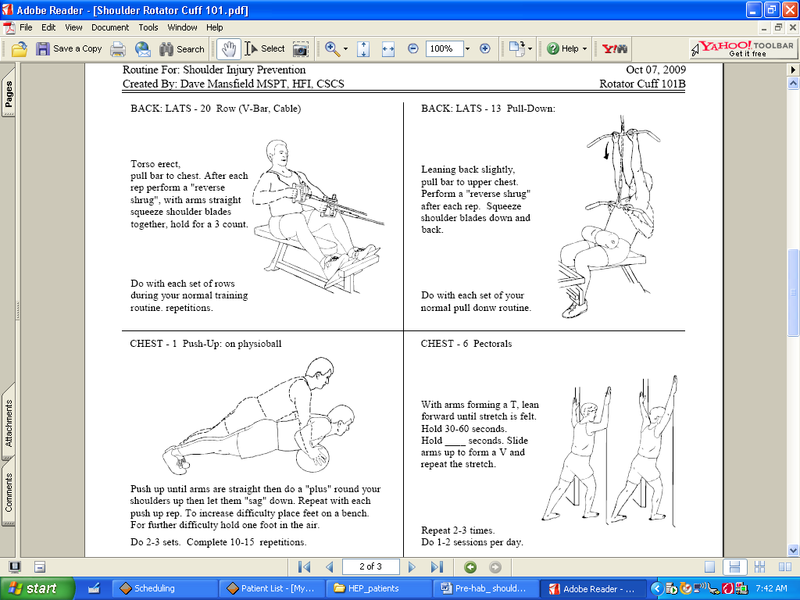 See the appendix for samples of a rotator cuff strengthening routine. The Para scapular muscles are larger muscles that serve to help us maintain good posture. These muscles include the serratus anterior, rhomboids, middle trapezius, lower trapezius, teres major as well the thoracic spinal erectors. These muscles also serve to counteract the forces exerted by the pectoralis, anterior deltoids, latissimuss dorsi and coraco brachialis. These are the “pulling muscles” of the upper back and need to be trained in equal measure to their opposing muscles. This is where the idea of “push/pull” strength training programs comes from. See the appendix for some ideas on training these muscles. In general when you are strength training these upper back muscles you should be sure to use full range of motion. This means, for example, that when you do a rowing exercise, you retract you shoulder blades at the top of the movement and pull the weight all the way in to your chest. 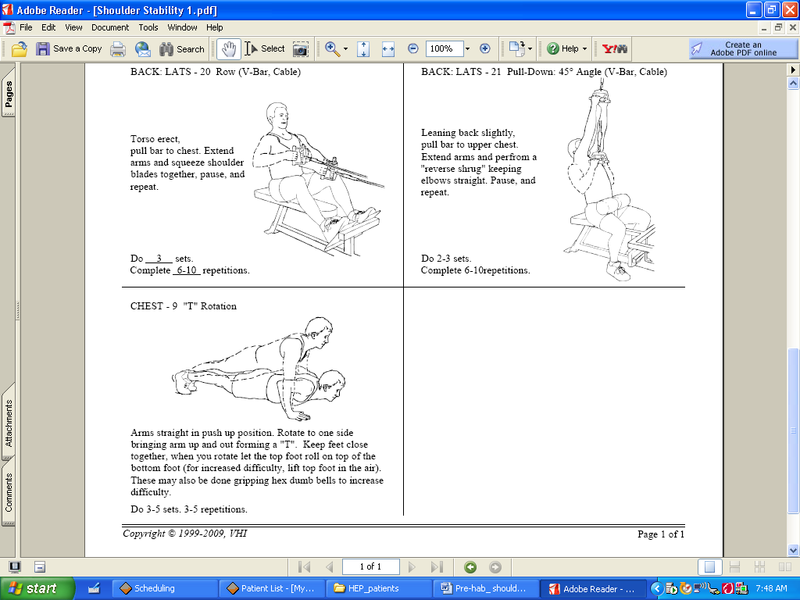 The are also a number of assistance exercises that you can do to help keep a strength balance in these muscles. Again, see the appendix. In addition to maintaining a strength balance around the shoulder joint we need to maintain a range of motion balance. Short, tight muscles in the chest and front of the shoulder combined with stretched and (relatively) weak muscles in your upper back are a recipe for shoulder injuries. In addition, many of us are restricted in the upper back (thoracic spine) so this area usually needs attention as well. If these thoracic spine segments are severely restricted you may need the services of a Chiropractor, or Sports Physical Therapist to mobilize your upper back. This article is intended as a general overview of factors that contribute to (non-traumatic) shoulder injuries. Many shoulder problems are preventable with a well-designed training program. If you already have a shoulder injury you should seek appropriate medical advice. If you do not have a shoulder injury now then incorporate a prehabilitation or injury prevention program into your week. In future articles, we will go into more detail and variations on shoulder injury prevention.